Having started to work in groups of ten, you can think about your big group only through your “ten.” The ten is now the cell through which you connect to the world, whether it is speaking to your wife or to your boss at work. Every action you make is through this group; you dress in them. A group of ten is not about physical bodies, but about principles that we clarify and fulfill together. Gradually, you begin to feel that this invisible, airy formation becomes clearer, connects with the forms of your relationships, and takes on a certain weight, shape, stability, and a real, tangible existence. Now, in the relationships between you and others, you feel things that you only heard of or read about before. It already becomes a reality. I don’t worry about someone personally, but about the well-being of the entire family. This is the feeling I should have with regard to my group of ten so that I will approach every discernment and feeling only through it. Otherwise, I never will see the upper world. I must start looking at everything through this focusing lens, through an aperture adjuster. It limits my sight, and I look at everything only through it, through this very narrow aperture. If I look through a very small hole instead of using glasses, I will see everything sharply just as with glasses since glasses merely limit and focus the ray of light. This is why this very narrow aperture also allows me to see well as if I had very powerful glasses. We can look through the group in the same way. If you don’t look through the group, you won’t see the world. Question: What does a person get from the revelation of the Creator? Answer: By revealing the Creator a person attains the one upper force that operates in all of creation. By that everything becomes clear and understood. He sees all of reality that has no beginning and no end but only one fixed state. This one state explains everything to a person. He attains the upper dimension and has no question left. He lives above time, motion, and place, and there is no division to past, present and future; this is the reality that exists outside our physical body. Our body lives if there is a pulse, and thus it perceives reality, by feeling itself in time, meaning in the past, present, and the future, but when we exit the boundaries of our body, everything disappears. Then we find ourselves in the same state as the Creator. Now you are asking: “So what’s next?” But there is no such question since all our questions stem from a deficiency, from the desire to receive, which we want to fill, but when we are incorporated in the desire to bestow, all the questions disappear. We merge with the one unique force. We have to feel it and this will provide you with all the answers to your questions that cannot be expressed in words. When I entered the spiritual feeling it answered all my questions. This question doesn’t stem from mere curiosity, but from good will. You will discover spirituality and you will see everything. It says: “Taste and see that the Lord is good.” Before we taste this feeling, we cannot see Him and it’s impossible to explain it. When we attain Him everything will clear up by itself. Baal HaSulam, The Arvut (Mutual Guarantee): The Creator did not find a nation or a tongue qualified to receive the Torah, except for the children of Abraham, Isaac, and Jacob, whose ancestral merit reflected upon them…. Question: I am the one who has to make all the corrections that are expected of me from the very beginning to the very end. How can our forefathers’ merits help me? Answer: We all are in the unified system of Malchut of the world of Infinity that is filled with the Light of Infinity. It’s all that creation has, nothing but it. As the system continued to develop, a restriction occurred and circumferences emerged. There appeared a line that stretched from the circumferences to the center of the circles. Later, the line was shattered. The black circle in the very middle represents a corrupt desire with the intention to bestow. It stands for the real egoism that we still haven’t yet revealed. 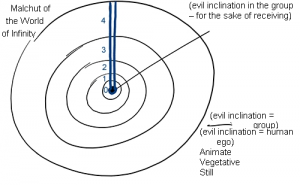 We have been developing through the still, vegetative, and animate levels to the speaking level at which we now discover our evil inclination: a slightly spoiled human ego. However, only when we join a group do we begin to reveal authentic evil. It’s at this time that we discover exactly where the intention to receive in its genuine form hides. It’s while in the group that the evil inclination is disclosed to us, thus allowing us to correct it. 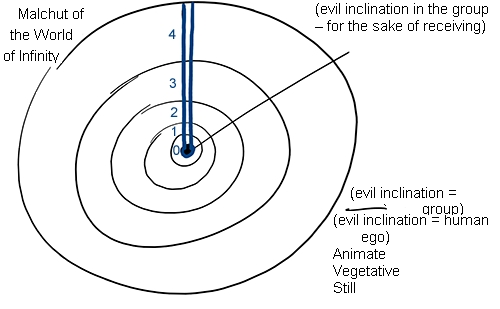 Personal correction happens in five “layers” of the desire (in the five levels of Aviut): from a level zero to level four, from light to heavy, from bottom up. We all are included into a bigger system where the general process of correction is going on. We are very far from being the first link in this process. Our forefathers were corrected before everybody else, then it was their sons’ turn, and only at the end of this chain is it about me and my group. In reality, our forefathers corrected the Aviut of level zero, their sons managed to correct the Aviut of the first and second levels, whereas we get to deal with Aviut of the third degree. So, there are souls that have fulfilled a part of the work, and their efforts were not in vain. Today, when we get to the point of correcting ourselves, we don’t start from scratch. Rather, we continue what they started and in our turn we continue building a foundation for those who are yet to come and follow us. This is how the general process goes: It starts with correcting “Israel” (Galgalta ve Eynaim) and extends to correcting “the nations of the world” (AHP). 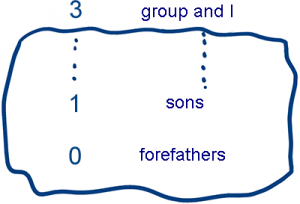 The first stage, the correction of “Israel,” splits into several phases: forefathers, sons, etc. “Nations of the world” also divide into 70 parts that are to be corrected in a certain order. This is how different parts help each other on their path to correction. This explains why today we live in a global society in which everybody depends upon others. Question: What is the indication that a person is advancing? Is it when he feels that he is increasingly more repulsed by the friends or that he values them more? Answer: A person’s advancement doesn’t depend on either one of these signs, but rather on the extent to which a person can “weave” the right picture and correctly combine the feeling of repulsion and attraction. The repulsion stems from the evil inclination and the attraction from the good inclination, and a person determines when he has to choose. He creates a connection, the combination, and he works like a weaver on a loom. Everything depends on how he combines the two opposite forces: He understands that the repulsion is just as essential as the attraction. He has to discover that all the forces that are revealed in him with regard to the upper are always a blessing, and for his own good. There is nothing in the world, in reality, that is harmful or bad; everything depends on whether a person can see and justify it. Can he unite the two opposite forces, not just in order to connect them but in order to make a new reality out of them? This is the new psychological picture of the world that is woven of two forces, as from two threads. This reality doesn’t exist by itself: All of reality, both the fictitious and the real, exist only if we begin to identify it as we create it for ourselves. So we have to try to connect all the power and force and obligate them to work together, as this is all our work. We have to see the whole Torah, human history, our whole evolution that is made of the creation of the spiritual reality from the two forces that were revealed to Abraham in this light, in this perspective. Our success depends on how well we manage to connect the two: the evil inclination and the good inclination, and do everything for the connection, the unity between them. In the News (from VentureVillage): “We often hear that a happy worker is a hard worker. But for a growing number of companies worldwide, it’s a truism that’s revolutionising workplace culture. Enter the Feelgood Manager or Feelgood Department; a Santa’s workshop for your workplace happiness and lifestyle needs. From finding you new friends and hobbies to organizing drinkathons and StarCraft-themed brunches. In between, a breadth of practicalities, such as lining up routine feedback sessions and even calling on a technician to install Cable TV round your place. “Many studies have shown that making employees happy raises productivity and profit levels: In short: workplace happiness equals more money. But for traditional types, this new ‘feel good’ role may raise a few suspicious eyebrows and undoubtedly – questions: Is caring creepy? Can you feel good at work without someone looking to raise your dopamine levels? “Sociable activities make up the cardinal ingredient to any ‘feelgood’ workplace. Everything from karaoke and German-language classes to movie screenings and bar-hopping events. My Comment: Integral education says that in the near future, specialists in this area will become the most demanded people in the world. Precisely they know how to create groups in the likeness of integral interdependence of people that manifests more and more. People will feel good only in such teams and outside of them, always bad! Question: It is known that a sharp qualitative change is always a change of phase, a sharp jump. Will integral development and correction be gradual or will a gap of potentials grow at first and a qualitatively new transition to a completely different level take place afterwards? Answer: A critical state is an explosion, a nuclear world war, and other problems. Thus, we must try to instill integral upbringing and education by all possible means. Also, if today we already see how effective it is to all kinds of organizations, then we can offer it to factories and institutions, various societies and communities, to housewives (via TV), schools, prisons, and so forth. We can instill the system everywhere possible, in any place where people even want to get just a bit closer to it, to begin to understand it at least a little bit. In the integral network, people connect between themselves through their desires and thoughts. This is how the “wisdom of the crowd” works when it connects and creates some product. Thus, we need to try to involve as many people as possible in integral unity, and they can act via their thoughts. Also, there is no importance here to the social standing of a person, not to his general education and so forth. They can be simple people as well as representatives of the elite. It doesn’t matter since at the next level all corporeal differences disappear. Question: In the workshop on the subject of integral unity for married couples, the question was asked: “What do women want from men?” And one of the women said: “I want my husband to survive through all my states.” What does that mean? Answer: A woman expects fulfillment from a man. She relates to a man as to her source of mental, spiritual, and psychological fulfillment. In some way, she begins to grasp the world through her husband, through the man. It’s specifically what she is waiting for and wants. Without that she doesn’t feel that she is connected to the world, to life as it should be. It’s as if she has no base point, a point of support. Psychologically, a woman wants to be next to a man who will be as a source of inner fulfillment. For this she is ready to give everything material, everything external, in order to receive from him what she is not able to create herself, meaning mental, spiritual, and psychological fulfillment. While the man, on the contrary, doesn’t need mental, spiritual, or psychological fulfillment from the woman. He needs support on the regular corporeal level. And thus they come in contact with each other. This is the way nature created us. How Can We Understand One Another? Rabash, “What is an Optional War in the Work,” Part 2: It is said: “My beloved is like a deer.” A deer turns its face backwards when it escapes. Thus the face becomes the posterior again. This means that He yearns and longs to adhere to Israel again. This generates longing in Israel too and the longing to be adhered to the Creator, and the extent of the yearning and the longing is actually the face itself. This is the only way we advance, and it isn’t only spiritual advancement, but also in the corporeal world where time goes by and there are good times and bad times in our evolutionary process. From the time of the shattering of the vessels onward, the Light constantly influences the vessels and the Reshimot (informational genes) change all the time from face to posterior and back to face again, at one time corresponding to the Light and at the other not, and this goes on continuously. So it seems to a person as if the Light comes and then it’s dark according to the state he is in. This is how corporeal life is arranged as joy and sadness constantly change, and it’s the same in spiritual work. But in spiritual work everything depends on a person and on his ability to awaken himself with the help of external means: the study, the group, the teacher, and dissemination. Thus he hastens time. The more he participates actively in hastening time, the more strongly he feels the lowliness of his nature, but at the same time, he also feels elation and the greatness of the goal he wants to attain. It turns out that the Creator constantly turns His face or His posterior to a person, which is in fact only the person’s feeling according to his attainment. It’s all a result of the changing Reshimot in a person and his own participation. the Light at absolute rest, the Creator who always wants to be in a state of “face to face” with a person and is waiting for this relationship. The main thing is to see that every state comes from the upper force and that it’s only in order to help us advance. Rabash, Letter 41: Thus the Torah is names of pleasures, and each pleasure has a different name. Question: There are also sufferings and troubles other than pleasures, what names should we give them? Answer: We name things according to the vessels, to the desires. It’s because we understand and perceive everything in the vessel, including the Light. It doesn’t exist by itself, apart from us, but rather like electricity about which we speak only with regard to its effects. Similarly, we discern the phenomena that stem from the Light, the effect of its actions inside us. Pleasures are extra Light, a filling by the Light, and everything is revealed in the vessel. This is where the names stem from. Each one indicates the beginning and end of an action, as well as what happened in the actual process. The name expresses an action that was performed by the force behind it. We, the created beings, have no other way to describe something. It’s because we don’t have any contact with the Light itself. We are limited in the matter of the desire and the form it takes on as it changes from its initial state until it resembles the Creator.